When you season ribs before preparing on the grill or in the oven, you ensure that the meat retains its delicious flavor. 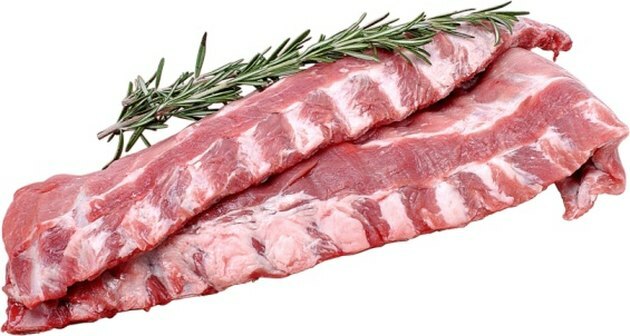 Because ribs have a lot of fat and bone, make sure you purchase plenty if you are preparing the meat for a large gathering. A hungry adult may consume as much as 1 lb. of ribs in a single sitting. Use generous amounts of dry rub on the meat to give your ribs a smoky and spicy flavor. Remove the membrane before seasoning because it blocks the flavors from the meat. Rinse the rack of ribs in cold water. Pat the meat dry with paper towels. Lie the ribs on a flat surface meat-side down. Use a knife to peel off the thin layer of membrane secured to the ribs. Start removing the membrane from one of the corners of the ribs near the bone. Discard the membrane. Cut off any excess fat from the ribs. Leave a small amount of fat to keep the ribs tender. Rub liquid smoke over both sides of the ribs. Hickory or mesquite flavors of liquid smoke will taste delicious on your ribs. Season both sides of the ribs with a generous amount of salt, pepper and garlic powder. Place the ribs on a platter and cover with plastic wrap. Refrigerate the ribs for a minimum of four hours, but no longer than 24 hours. Remove the ribs from the refrigerator and cook as directed. Leave the seasoning in place when you roast or grill the ribs. You may add extra seasoning by basting with barbecue sauce while cooking if desired. You can choose to forgo the liquid smoke and only use dry ingredients to season the ribs. If you find it difficult to get the seasoning to stick to the ribs, you may brush the meat first with a small amount of olive oil or mustard and then apply the seasonings.